This entirely absorbing history of England’s early and distinguished golf club conveys the passion of those who established our golfing traditions during an era in which the elements of the game were indubitably crude. Authors Henderson and Stirk help the reader believe that they can relate, in spite of the passage of generations, to the precise anticipation and feeling of our earliest pioneers from a time before those we most commonly know by name today. The account of the membership of Blackheath connects us to the long-dead nameless pioneers who created the conditions for future sportsmen like Park, Morris, Vardon, and Jones to be immediately identifiable to readers even one hundred years after their own time. Remarkably, the love of the game stems from the same passion that resounds through us all, from high to low handicapper even to this day, and so shall it likely remain. From the outset of this expertly-assembled history, the reader is drawn into the long arc of history that is the story of the growth of golf. As the authors put it, “organized golf” began in the middle of the eighteenth century. Their opening thesis links the development of the “cheap gutta ball” in 1848 to the Industrial Revolution in Britain, and the establishment of efficient railway travel to what we all know to be the meteoric explosion in the interest of golf. But Blackheath dates back 250 years before this era, and this line sets the hook. The authors’ research in Scotland and England demonstrates that groups of freemasons “had the happy idea of adding golf as a healthy form of exercise prior to their dining.” They cite the arrival of golf at Blackheath during the court of James I (a Scot), when he and his Scottish Court arrived in London in 1603 (the Clubs mark boasts, “instituted in 1608”). Wee Nip readers may be reminded that at that time, there were no established rules of golf; those were not conceived for another 136 years! And while the Club claims 1608, the authors note that the earliest direct records uncovered date only to 1766, ten years prior to the American Revolution and 22 years after the rules of the game were invented by the Gentlemen Golfers of Edinburgh. Furthering the link to the freemasons theory, Stirk and Henderson note that – as a secret society – the freemasons were prone to “a systematic destruction of early minutes.” The ties run deep. 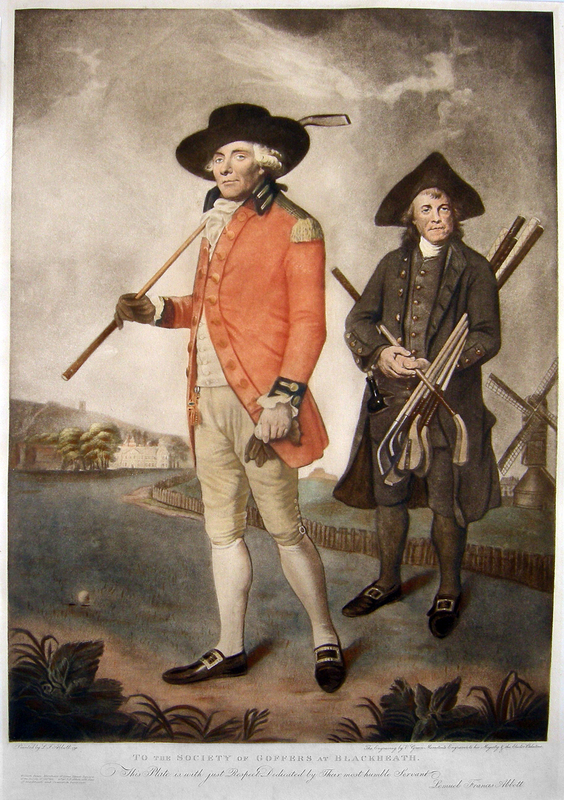 In examining the earliest minutes of the six known golfing societies of the mid 18th century (Royal Burgess 1735, Honorable Company in Edinburgh 1744, R&A 1754, Bruntsfield 1761, Musselburgh 1774, and Blackheath) a minute of the Honorable Company of Edinburgh Golfers from 1768 states that all the members present were masons, and it gives their names and masonic rank. They additionally note that members of these societies, as with the Masons, wore uniforms, had regular dinners, were fined for non-attendance, and had to pay-up for the birth of a child or a marriage and had separate bet books, toasts, etc. Some of these societies also used Masonic toasts in their own rituals as late as 1838. Virtually all of the early societies have founding dates that predate any existence of minutes. It is believed that as non-masons began to join the ranks, the early minutes were destroyed so as not to reveal the mason’s secrets with one another. By the mid 1800s, Blackheath extended its course to seven holes, and the redesign then included frequent crossings of the massive gravel pits on the site. (The heath was a primary source of gravel for the expansion of London.) By the 1850s, golf was becoming more important than dining as membership and the interest in the game grew. As a clear demonstration of this, in 1851 Willie Dunn was hired away from North Berwick by the club, joined three years later by his twin brother, James, to maintain the course and equipment. Interestingly, when the first Open was contested in 1860, there were only eight players, one of whom represented Blackheath. The book features elaborate documentation of the influence of the club and its members in the formation of other clubs around the world. It also details the historic archives, medals and ceremonies through the modern day. We too often only read about the world of golf starting in the early 1800s. This narrative treasure has an engaging way of connecting the modern reader with those who, in actual fact, fueled our passion for this great game, but at a time when it could hardly have been so fashionable to do so.